Figure 1. 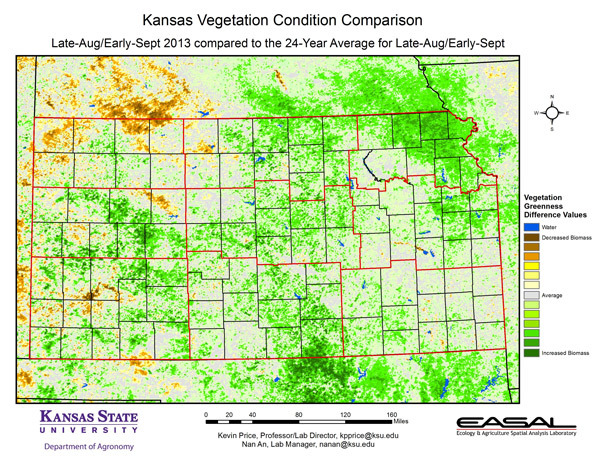 The Vegetation Condition Report for Kansas for August 20 – September 2 from K-State’s Ecology and Agriculture Spatial Analysis Laboratory shows that greatest vegetative activity is in extreme northeast Kansas, particularly in Brown and Doniphan counties. Cool, wet conditions this spring delayed planting and emergence in these areas, and the impact of that delayed development is still visible. In contrast, northwest Kansas has the biggest area of low biomass activity. April – August precipitation in this division was only 56 percent of normal. Figure 2. 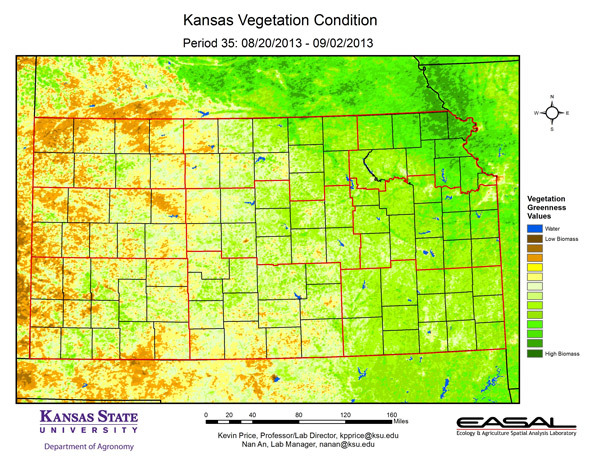 Compared to the previous year at this time for Kansas, the current Vegetation Condition Report for August 20 – September 2 from K-State’s Ecology and Agriculture Spatial Analysis Laboratory shows that conditions are much more favorable, despite the low to moderate photosynthetic activity this year. Even northwest Kansas has about the same level biomass productivity this year as last. For this region, the biggest contrast between years has been in temperature. For example, last year Atwood averaged the 3rd warmest growing season (Apr-Aug) on record, while this year ranks 56th. Figure 3. 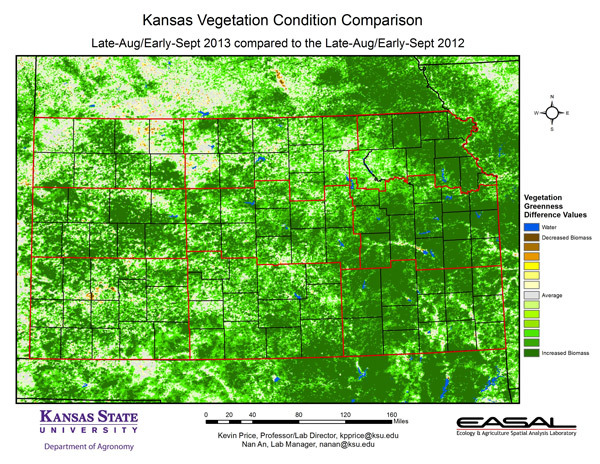 Compared to the 24-year average at this time for Kansas, this year’s Vegetation Condition Report for August 20 – September 2 from K-State’s Ecology and Agriculture Spatial Analysis Laboratory shows that Cheyenne County continues to have below-average biomass productivity, as does northern Decatur County. The greatest area of above-average photosynthetic activity is in extreme northeast Kansas, and in southern Sumner County. The above-average photosynthetic activity in northeast Kansas is more directly related to delayed plant development than favorable moisture. Despite rains last week, the region is still below average for the growing season. Figure 4. 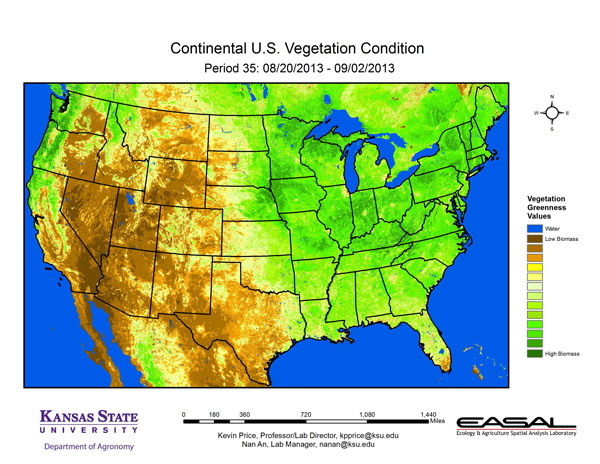 The Vegetation Condition Report for the Corn Belt for August 20 – September 2 from K-State’s Ecology and Agriculture Spatial Analysis Laboratory shows that the region of greatest photosynthetic activity is concentrated in the northern areas of Minnesota, Wisconsin, and Michigan. High biomass productivity is also prominent in southwestern Minnesota, and along the Missouri River in northeastern Nebraska and western Iowa. In these areas, the cool wet start to the season has delayed crop development. Figure 5. 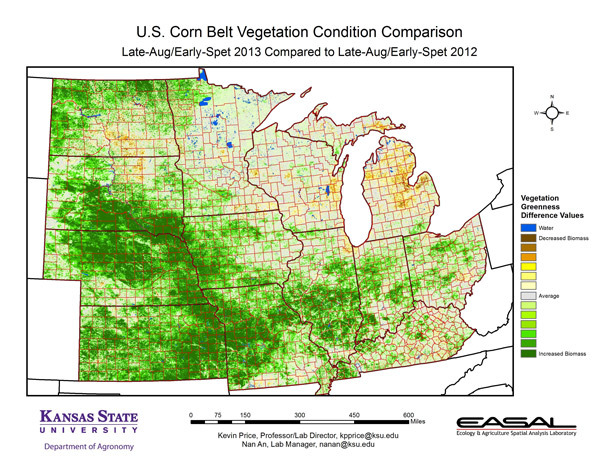 The comparison to last year in the Corn Belt for the period August 20 – September 2 from K-State’s Ecology and Agriculture Spatial Analysis Laboratory shows that biomass productivity is mostly higher. The biggest increase is along the southern and western stretches of the region. This is related mainly to the more seasonal temperatures for much of the growing season this year. Figure 6. 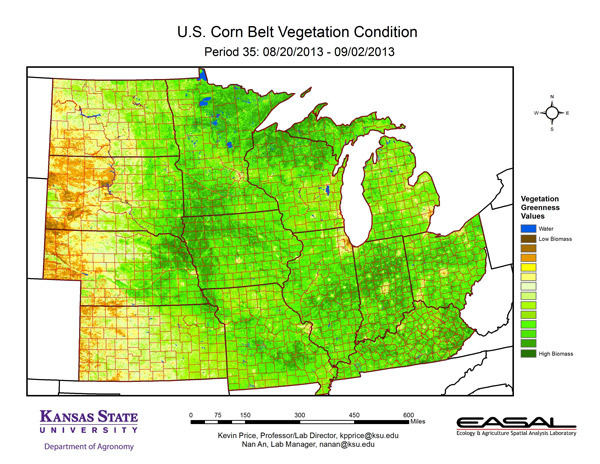 Compared to the 24-year average at this time for the Corn Belt, this year’s Vegetation Condition Report for August 20 – September 2 from K-State’s Ecology and Agriculture Spatial Analysis Laboratory shows that most of the region has close to normal productivity. There is a very sharp gradient in Missouri, where dry conditions in the northern areas of the state have resulted in rapid deterioration in vegetative conditions. Figure 7. 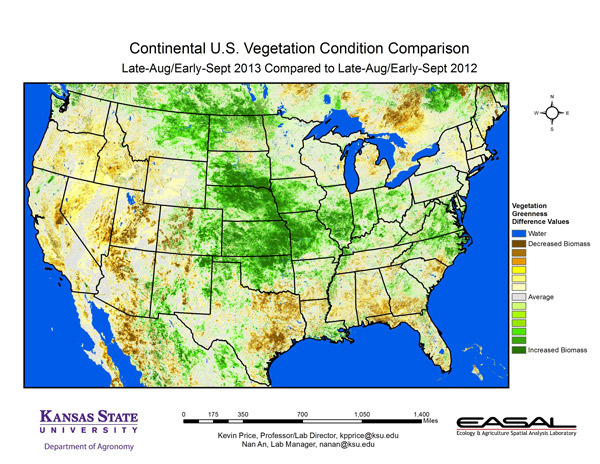 The Vegetation Condition Report for the U.S. for August 20 – September 2 from K-State’s Ecology and Agriculture Spatial Analysis Laboratory shows that the region of highest biomass productivity is along the Cascades in the Pacific Northwest, as well as along the Missouri River basin in Nebraska and Iowa. There is some masking of the vegetation in southwestern Nevada due to the smoke from the Rim fire in the Yosemite National Park. Figure 8. 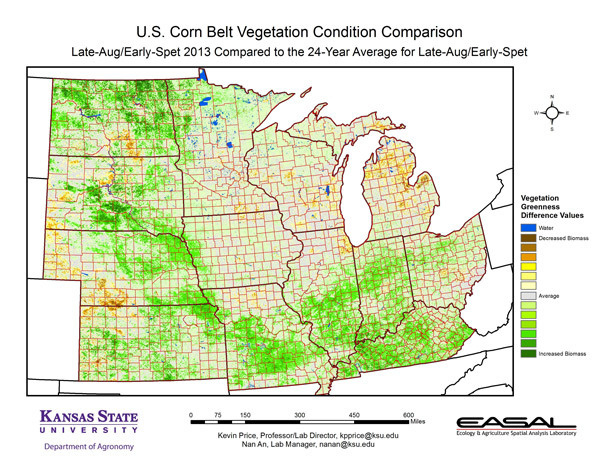 The U.S. comparison to last year at this time for the period August 20 – September 2 from K-State’s Ecology and Agriculture Spatial Analysis Laboratory shows that the greatest change continues to be in the center of the country. More moderate temperatures and favorable rainfall have allowed for greater biomass productivity this year. Many of the hay producers in the region are reporting much better-than-average production. Figure 9. 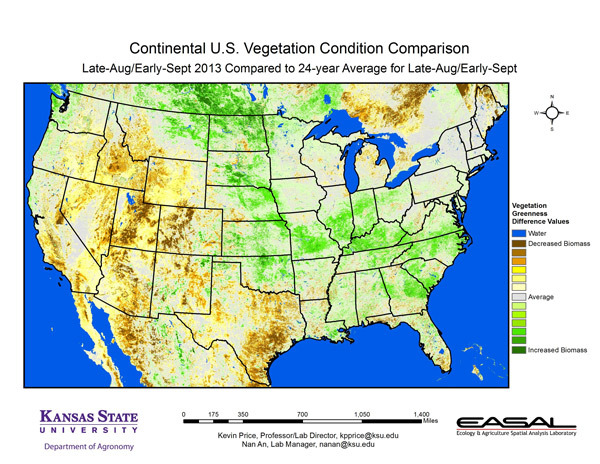 The U.S. comparison to the 24-year average for the period August 20 – September 2 from K-State’s Ecology and Agriculture Spatial Analysis Laboratory shows that the western half of the country has lower-than-average productivity, as does east Texas. East Texas continues to show moderate to extreme drought. The masking effect of the Rim fire in northern California and southwestern Nevada is particularly visible in this image. The continued drought conditions, and much warmer-than-average temperatures, have limited biomass productivity particularly in Utah and western Colorado.